As Joe Mathews explained yesterday at Prop Zero, Cal-Access, a database of campaign/lobbying contributions and expenditures, is powered, as is much of the state government’s information infrastructure, by aging 2oth-century technology. When the system crashed a few weeks ago, the Secretary of State’s office found itself with an expensive and technically tricky repair job on its hands. There seems little disagreement that the state needs to buy a new system to run Cal-Access. But California, with a broken system of government that leaves it in perpetual budget crisis, has no money sitting around to invest in such things. And at a time when the state is making cuts that jeopardize the public safety, health, and education of its citizens, no sane person would suggest that buying a new Cal-Access system would have a high claim on any new general fund revenue that might become available. That makes Cal-Access a perfect candidate for user financing. Although it is offered as a general public service, it is used most heavily by a small and selective group of inside political players: media companies, political consultants, lobbyists, special interest donors, vendors of political services, non-profit organizations. It is how they keep track of the political money game, monitor the moves of rivals, and check the prevailing prices and wages in the political game. You can tell how much the inside players value the service Cal-Access provides by the volume of their complaints over its absence. Here is a market opportunity for government. So, by all means, let’s get Cal-Access up and running, and then invest in a modern system. And let’s do it by having the users pay. People who want to use the system would set up accounts. As at many media sites, there would be tiered pricing. Users would get a small amount of access free, enough to meet the needs of ordinary voters. Heavy users would pay according to their usage. Nonprofit organizations that repackage and interpret the information in forms freely available to the public would get free access. The money paid by users would support both the capital and operating costs of the site. This is a solution everyone should love. Liberals will get political transparency. Inside political players will get a modern and reliable Cal-Access system. Conservatives will get an example of government's operating like a business and responding to the demands of the market. Policy wonks will move closer to their goal of having user-financing for non-general services, reserving general revenue for general needs. And California will have made an important point: You can’t have something for nothing, even if you’re an editorial writer or a political consultant. One of the most common, and most facile, journalistic takes on California’s governing crisis is to compare the state to Greece. This is simply wrong. As Harvard University economist Dani Rodrik explains on his blog, Greece stands in an entirely different, and more perilous, institutional relationship with Europe than California does with the United States. But Rodrik leaves out something even more important in the comparison. For all its woes, California is nothing like Greece either fiscally or economically. Although some in California seem not to know it, one of the major effects of state government is to transfer tax dollars from the coast, where California generates most of its wealth and income, to the less affluent interior of the state. 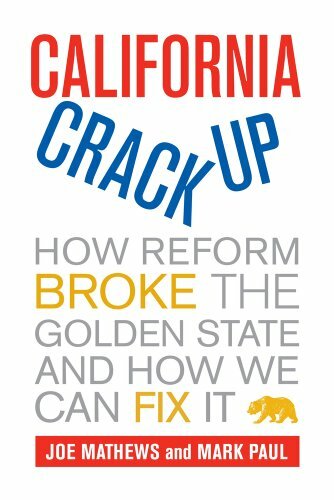 Splitting California to create a new South California would be the beginning of an unprosperous and unhappy marriage. Jeff Stone, a Riverside County supervisor, is basking a moment in the media sun by resurrecting that hoariest of notions, that California be split in two. He wants to free his constituents of their bonds to the high-taxing, big-spending, business-regulating, gay-marrying folks of the Bay Area, northern California, and Los Angeles and break off a new state of South California, comprising 13 inland counties from Mariposa and Mono on the north to Imperial and San Diego on the south. His proposal will quickly go the way of all such gimmicks. And for that the people of his proposed South California should be very glad. Because one of these days the rest of California might very well take them up on the offer of divorce. Like other recent would-be state splitters, Stone seems unaware of the big fact of California’s political-economic geography. In California, water flows south and west from the mountains to the valley and coast, but money flows west to east, from the coast toward inland areas. The big money in California is earned and the big ideas are hatched within reach of the summertime Pacific fog. Hollywood, Silicon Valley, the premium vineyards, the most productive marijuana plantings, and seven of ten University of California campuses: All are within 40 miles of the surf. And a disproportionate share of the taxes paid by the robust economy on the coast ends up financing public services for people living in the less affluent interior. The chart below shows how Stone’s proposed SouthCal would stack up on spending and taxes compared to California as a whole. State government educates, medicates, and incarcerates. Public education, health care, and criminal justice account for more than 80 percent of the state budget. 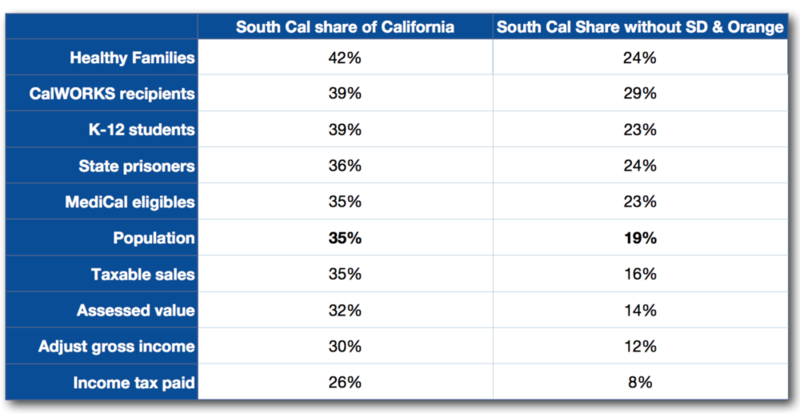 The counties that Stone would turn into SouthCal receive at or above their proportional share of those key three functions. (And an even higher share of social welfare benefits.) But as the table shows, they fall far below their share in generating income or revenue. As it’s now constituted, state government is a machine that raises money on the coast and ships a lot of it inland to Stone and his fellow South Californians. His proposal would break that conveyor belt and leave SouthCal (which already has an unemployment rate higher than the state as a whole) much worse off. But notice that Stone doesn’t propose to divorce the entire coast. Like former Assemblyman Bill Maze, who proposed a similar split a few years back, he wants to include Orange and San Diego counties in his new paradise. He didn’t ask their permission to include them in his breakaway state, and if you look at the third column of the table, which shows how SouthCal would fare without Orange and San Diego, you can see why. Even more than the current state, SouthCal would be dependent on its coastal higher earners to pay for services for people in the inland areas. It is hard to understand why Orange and San Diego residents would want to sign up for that duty. In fact, they and the rest of the California that Stone wants to divorce may begin to see some merit in his offer to walk away from the rest of us. Shorn of SouthCal, the remainder of California would find itself without a budget deficit. There would be many more places for California children at UC and CSU campuses, where the sons and daughters of Fresno and Riverside would now be paying out-of-state tuition. And there would be a lot fewer elected Republicans screaming about high taxes but then complaining when the Legislature cuts spending for their redevelopment agencies, cities, and local schools. Right about now, a lot of Californians might see that as a very good outcome.